Normally it’s difficult to predict who will take pole position for a Grand Prix. Typically this season, there have been at least four drivers in with a chance of the top spot in qualifying. But at the German Grand Prix, it seems quite clear that Sebastian Vettel and Red Bull have a clear advantage. 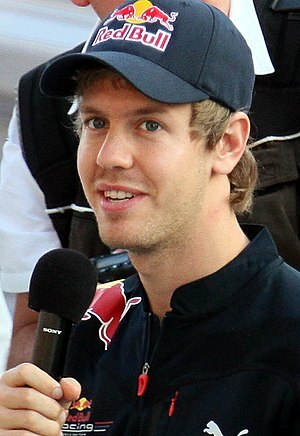 In final practice, Vettel finished up three quarters of a second clear of second-placed Nico Rosberg. While it’s possible that fuel loads had something to do with the gap, it seems unlikely that it would explain the entire difference. Vettel has found performance the rest of the field does not have, and he will be hoping that his car continues to perform at its current high level. But Vettel will have his challengers. Mark Webber in the other Red Bull has yet to outqualify his team-mate this season, which is not a record he will want to keep going. He has the same car as Vettel, so it is all about setup and driver performance to make up the gap to Vettel. Mercedes will also be going all-out for pole position. Nico Rosberg has been second quickest in all three Free Practice sessions this weekend, and is well-placed for a strong challenge for victory tomorrow if he can keep up his pace into qualifying. But to challenge Vettel, he will have to find some more speed in his Mercedes. Lewis Hamilton in the other Mercedes has had a tough weekend, battling for rear-end grip in his Mercedes. He finished FP3 over a second down on Vettel’s pace, which will be extremely concerning for Mercedes. They will be working flat out in the break between FP3 and qualifying to try to extract some more performance from Hamilton’s car. Behind Red Bull and Mercedes, it’s a battle between Ferrari and Lotus for the third and fourth rows of the grid. There could be some surprises – McLaren, Force India and Toro Rosso are all looking reasonable and could make a challenge reasonably high up on the grid. They are, however, unlikely to challenge for pole position. Further back, it’s all about saving face. Williams will be hoping to get both cars into Q2, something they haven’t managed very often this season. Tomorrow’s German Grand Prix will be the Williams team’s 600th Formula One race, and they would dearly love to celebrate it with strong qualifying and points in the race.